Hold high expectations for your child’s success. Provide healthy meals and snacks for your children. Establish a daily routine, including time for homework and academic support. Keep your child home to recuperate during times of illness. Be aware of classroom procedures, rules, and schedules. Make sure your child is at school every day on time. Conferences will take place with the child’s teacher at least twice a year. Report cards and AzMERIT results will be sent home. School-wide phone messaging system will leave weekly messages. Parents help and support at school. Parents volunteering in the school make a difference. Contact Evelyn See, our volunteer coordinator, for more information. Participate in family involvement nights . Read with and to your children daily. Take family field trips to museums and other points of interest. Use family errands as learning tools such as budgeting, making change, shopping for repairs, using measurements, estimating, telling time, reading maps, following directions, etc. Give children responsibilities in the family such as daily chores. We encourage you to attend a Title I meeting each year to learn about our Title I program. There will be several dates offered, so be sure to watch for more information in the newsletter. You may request additional meetings. We encourage you to participate in decision-making and policy development activities as well as improving the parent involvement plan and the compact for learning. As a school, we will provide you with information about programs, curriculum, assessments, and expectations for your child’s achievement. We will offer information to all parents equally in a form/language they can understand. As a member of the site council, you would be involved in the development and evaluation of the school wide plan. If you have concerns about the plan, we invite you to share those concerns with the site council. The Altar Valley School District, in cooperation with parents and community, expects all students to achieve academic and personal excellence in a challenging, relevant, and supportive learning environment. 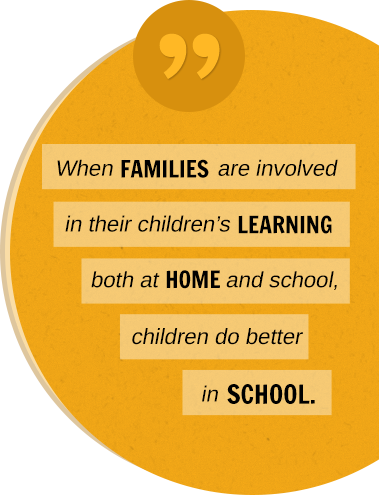 When families are involved in their children’s learning both at home and at school, children do better in school. As a district, we welcome families to be active participants in the education of their children. Together we are partners in your child’s education as we follow this compact.